Lomaiviti is the Fijian name for a group of islands east of Viti Levu. The islands include Ovalau the quaint former capital of Fiji, Levuka; Moturiki, Makogai, Batiki, Narai, Gau and a number of smaller islands and islets. This includes Toberua and Wakaya whose exclusive resorts offer superb diving as does a live-aboard vessel which frequents this area. It was on the island of Ovalau at Levuka that the first European beachcombers set up camp. Levuka witnessed great debaucheries and political alarms until Fiji was ceded to Britain in 1874 and the township became the colonys capital. Lack of room for expansion saw the capital move to Suva on Viti Levu, thus consigning Levuka to a backwater, ideal for those wishing to experience living history. The eastern coast of Viti Levu which sweeps to its northernmost point is known as Ra. These islands are approximately two hours by car from Nadi Airport on a modern tar-sealed highway through sugar cane fields and views of Bligh Water and its reefs and islands. Wonderful diving offering walls lush with soft corals, gorgonia, feather stars and hard corals as well as profuse fish life including large fish and large sharks. Some of the sites guarantee schools of pelagics including hammerhead sharks, barracuda, turtles giant trevally, manta rays, moray eels and even tuna. 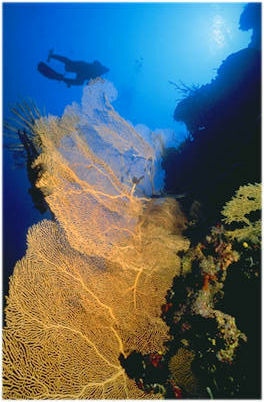 The area around Nanaui-ra and Nanani-i-cake has produced many sites within the short time diving services have been available but much remains to be explored including the nearby reefs in Bligh Water, such as Charybdis and the area around the Vatu-i-ra island which marks the north-western extremity of the channel diving Viti Levu and Vanua Levu. Current sites feature black coral, profuse soft corals, hard corals, walls, caves, prolific fish life including large fish as well as turtles, dolphins and on occasions whales on their way through the channel.